IT'S official - Gladstone is home to Central Queensland's best pork sausage, and it's available at Kin Kora Meats. 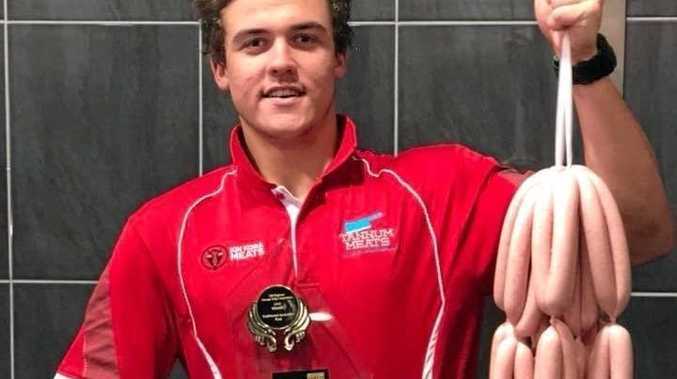 The snag was the winner of it's category in the Regional Sausage King and Best Butcher's Burgers Competition, held at Beef Australia in Rockhampton this week. It is a sausage created by third year apprentice butcher Matt Wilson, the son of Brendon and Melanie Wilson who own both Kin Kora and Tannum Meats. Melanie Wilson said they initially steered their son away from the trade, but were proud that he followed his passion. "He actually made the winning chicken sausage last year too," Melanie said. "He's in third year, and he started with a school-based apprenticeships. "We actually pushed him away from it but he didn't like anything else, he just wants to cut meat." The winning sausage is a pure pork sausage with no additives, a category which both Tannum Meats and Kin Kora Meats have previously placed in. Melanie said it was a big achievement to do well at Beef Australia. "I think whenever it's based in Rocky, and because it was Beef Australia there were a lot more entries than previously," she said. "The Capricornia is always a big region when they do their competition. "Unfortunately our other products didn't do as well this year, the competition was that hard." Both butcher shops have won numerous prizes at past events. The businesses will have two butchers in the "best butcher" competition at Beef Australia this week, before taking their prized pork sausage south to The Ekka.